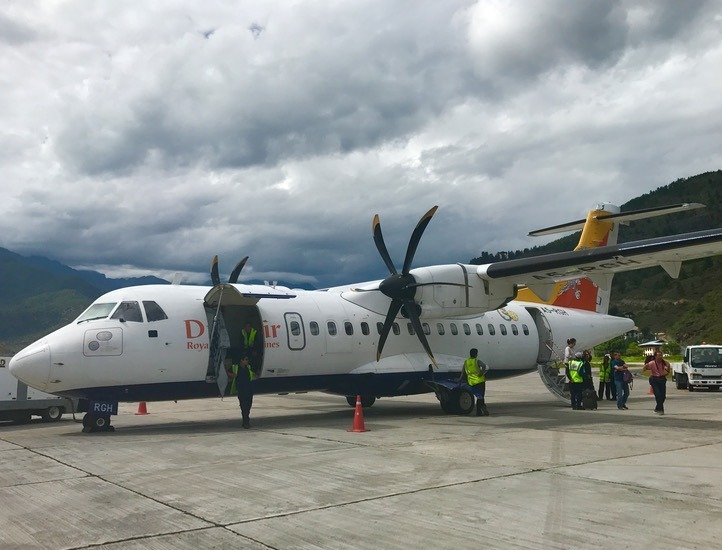 We took the scariest flight we have ever taken from Kathmandu into Paro, Bhutan. (You can read about that here World’s scariest airport to fly into). 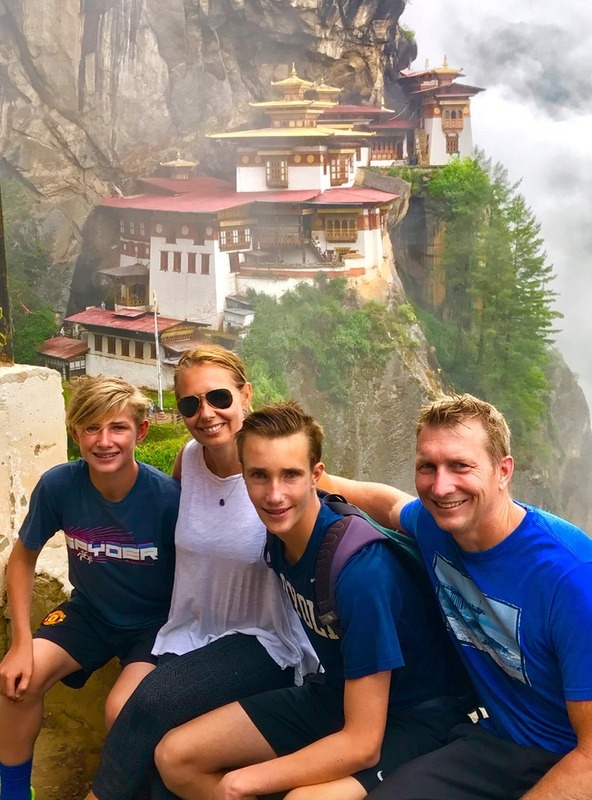 Our trip to Bhutan with kids was off to an adventurous start! 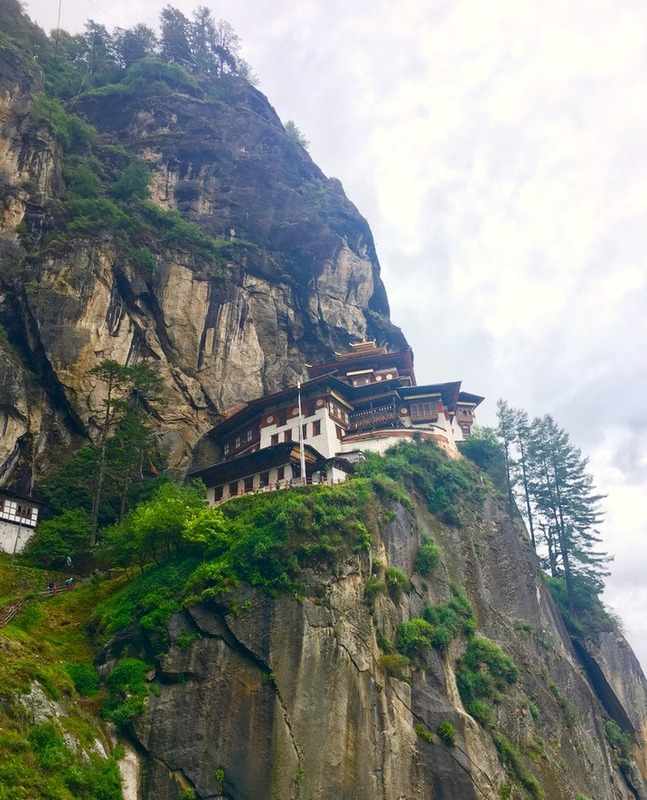 We immediately realized Bhutan was a very special place with its amazing topography of mountains, forests, rivers, clean air and small population. 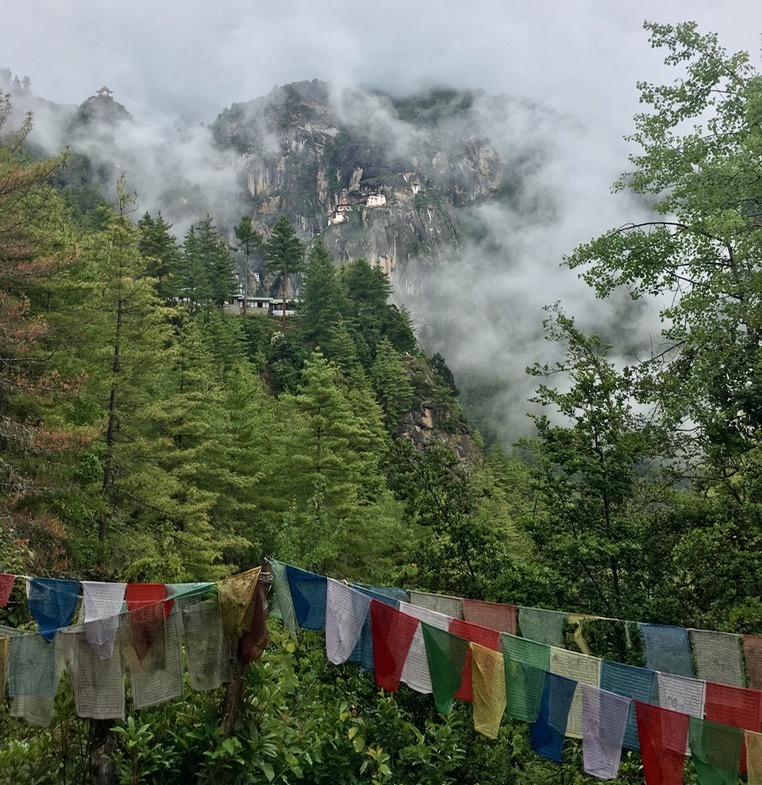 Bhutan is the last Himalayan Buddhist kingdom and is sequestered at 2,000m above sea level, has 73% forest cover and is the only country in the world to officially be carbon negative. 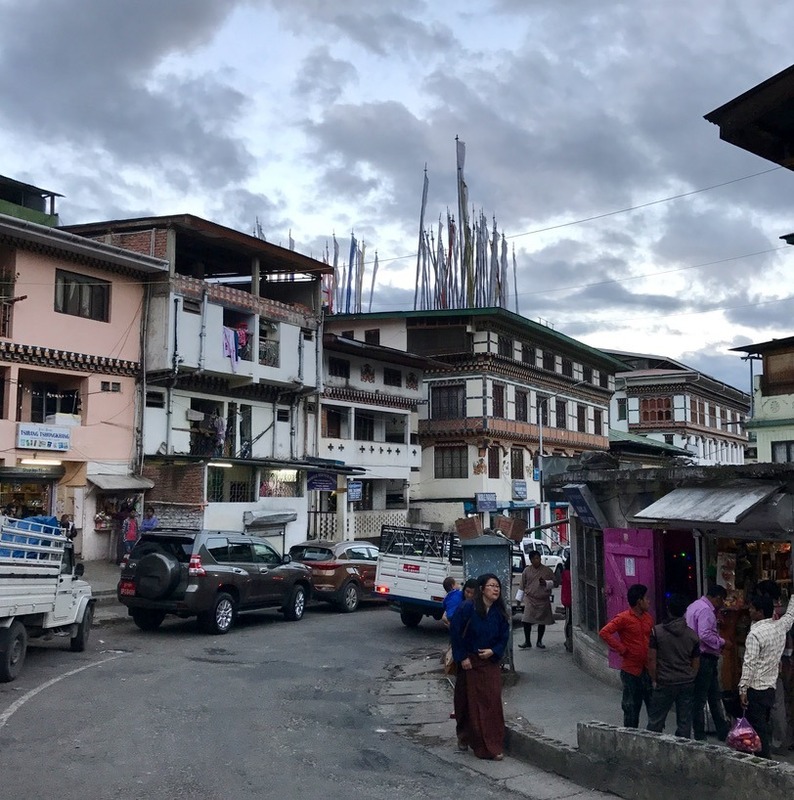 Bhutan was the last country to get television, and still is the last country without a traffic light. They don’t need them you see… with a population of around 700,000 people, with a limited number of cars, there’s no need. Sale and distribution of tobacco is illegal and the gho (knee-length robe that’s the Bhutanese national costume), is required for all men working for the government, schools or tourism industry. 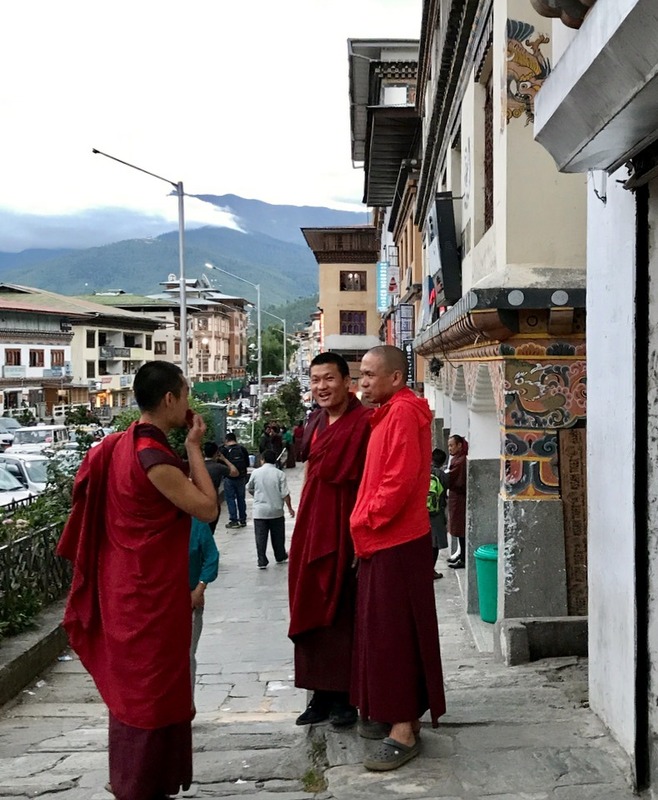 Most people have heard of Bhutan’s concept of Gross National Happiness, the unique way they measure the success of the country, yet to actually see how it works, in reality, is fascinating. 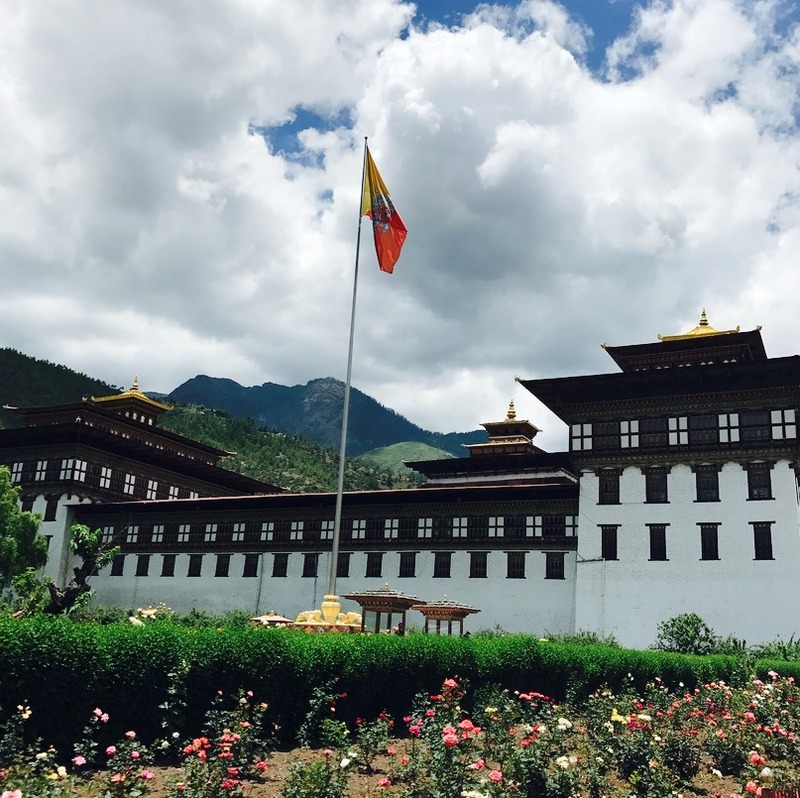 Bhutan has a policy of high-value, low-impact tourism aimed at attracting tourists who’ll respect the unique culture and values of the Bhutanese people (according to the government’s website). This means other than visitors from India, Bangladesh, and the Maldives, every visitor pays a tourist tariff of $240 – $340 per person, per day! (gulp)! 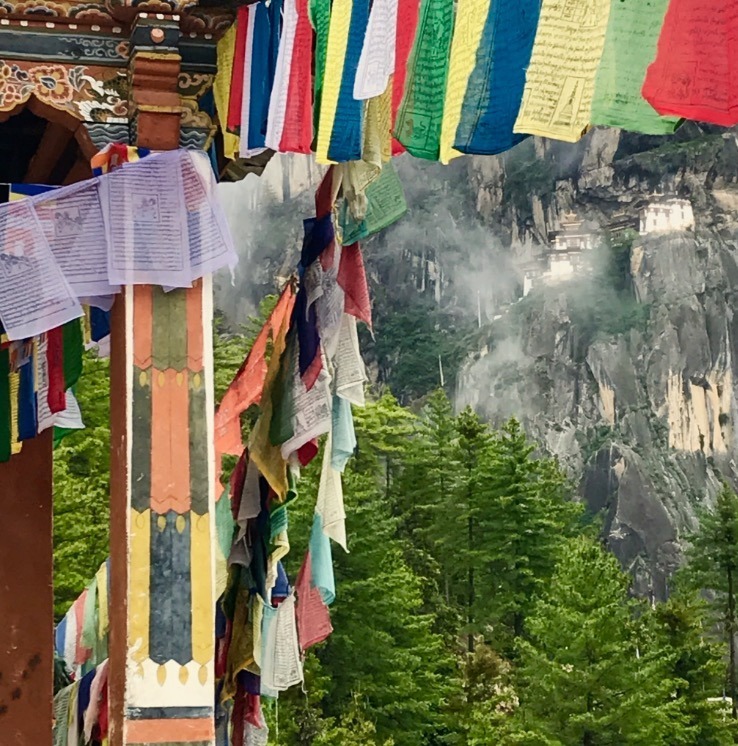 Knowing this, we were hoping for something really special from Bhutan… and we were not disappointed. 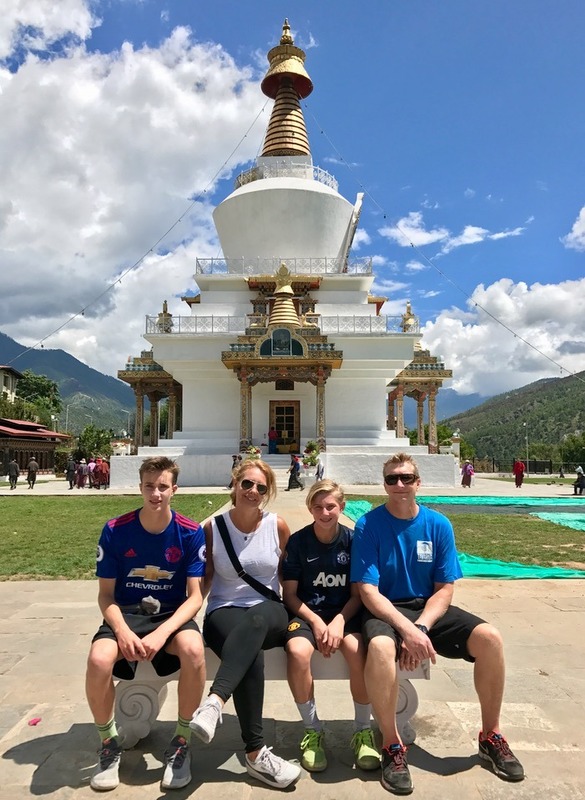 We arrived and drove an hour to Thimphu, Bhutan’s largest city. 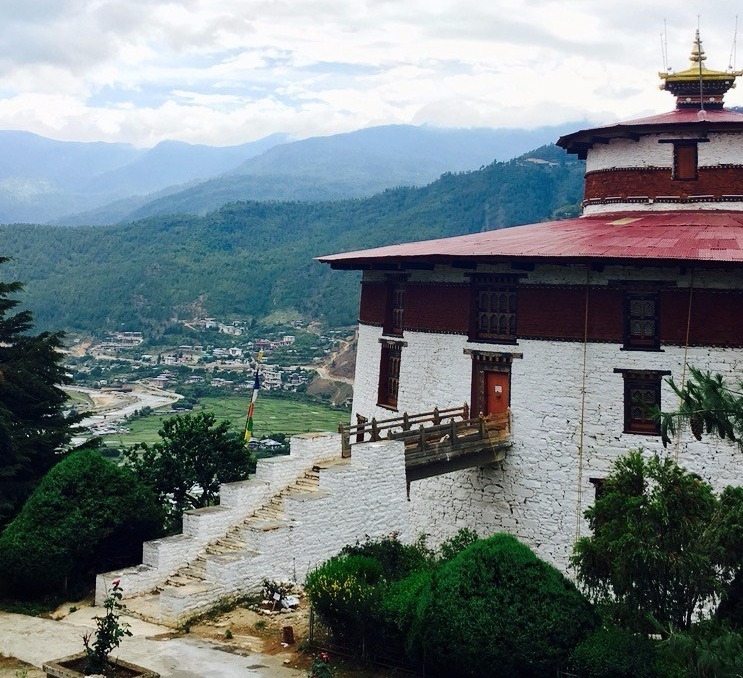 Thimphu is considered the country’s most modern city, yet still has the unique character of a Bhutanese town. After arriving at our hotel, we took a walk around town before dinner. The streets were filled with workers in national dress, Buddhist monks, and local people shopping the markets for dinner. 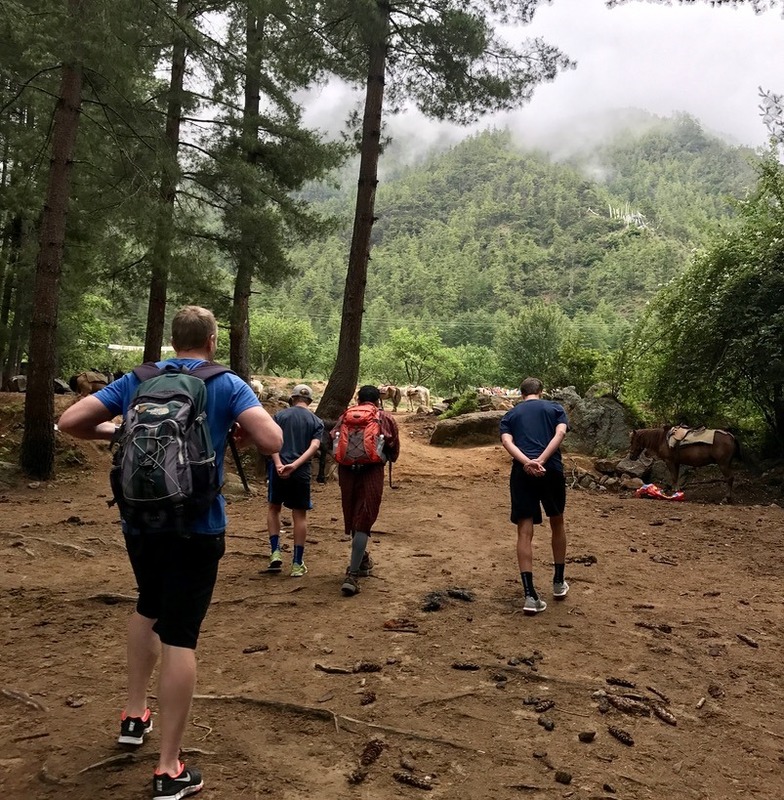 After a meal of local food (curry and rice dishes very similar to Nepalese food), we turned in for the night eager to be fully rested to explore the next day. 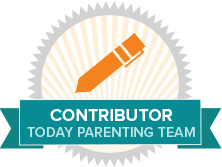 We woke, had a great breakfast (I’m giddy every meal when I don’t have to shop, prepare, cook, serve, clean, repeat…c’mom Mom’s – you feel me right?) and fuelled for our morning activities. 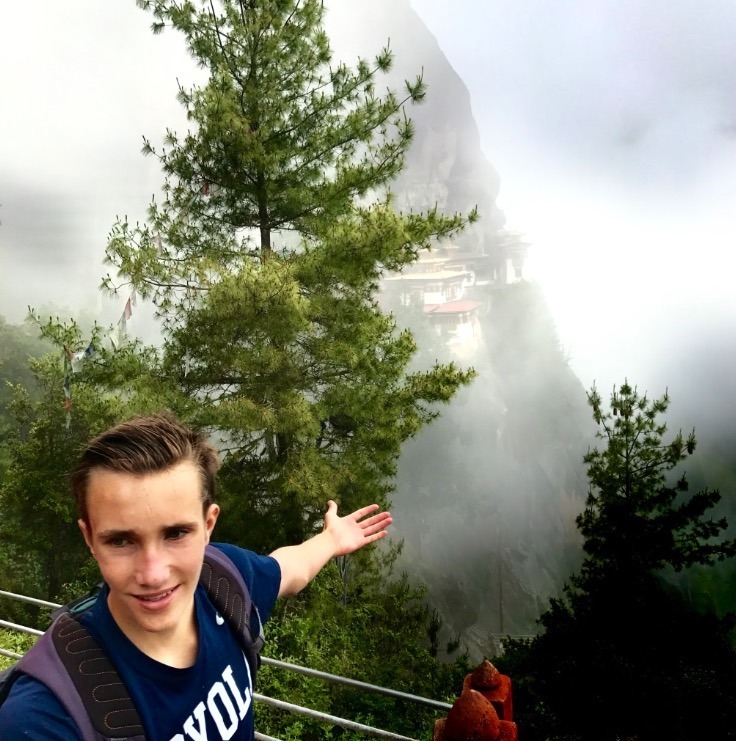 We already told Qewong we wanted to hike his beautiful country if possible. 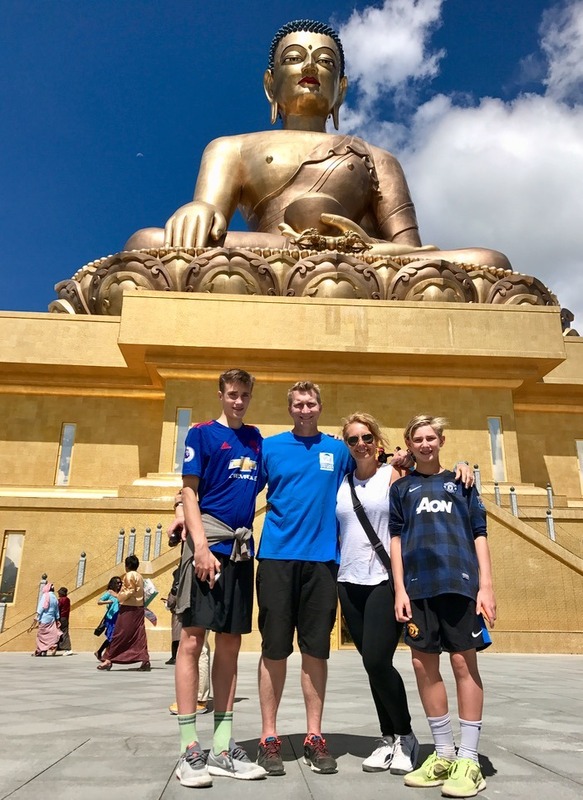 First stop was Buddha Dordenma, the largest sitting Buddha (169 ft) in the world resting high in the hills like a bronze god twinkling in the sun. 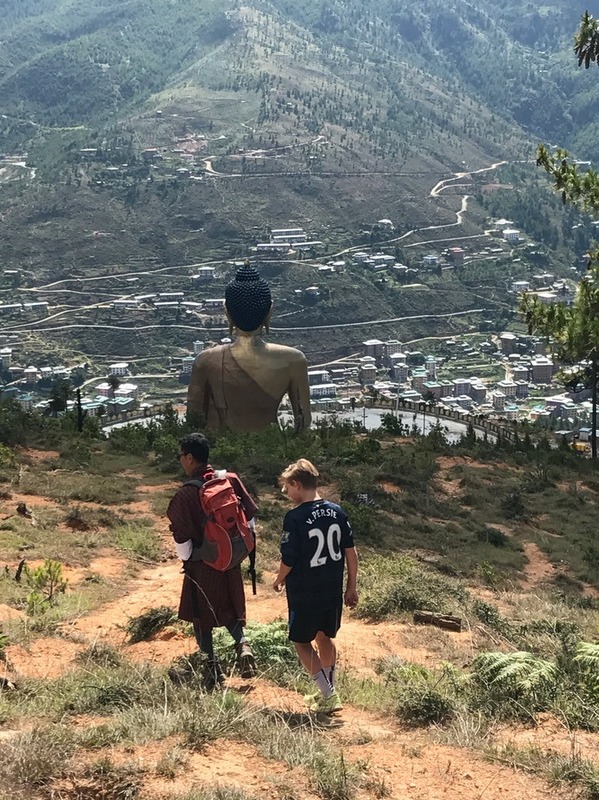 We parked at the base of the hill and hiked 90 minutes up steep hills, around the back of the statue, and finally down towards the golden statue. 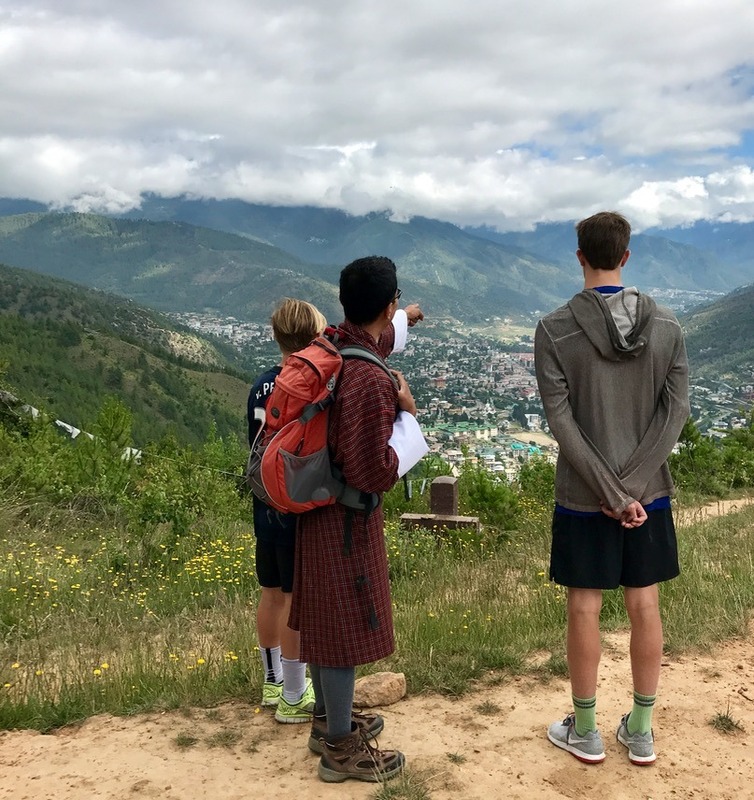 We were able to view it from every angle and enjoy the beautiful landscape overlooking the whole city of Thimphu. 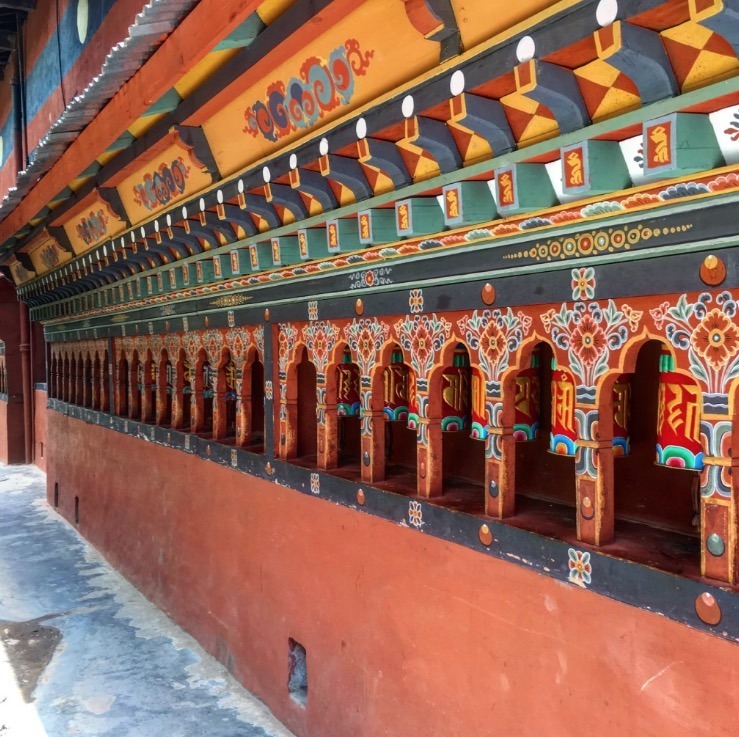 We then headed to Tashichho Dzong, a Buddhist fortress and monastery, and seat of Bhutan’s government since 1968. It presently houses the government and offices of the king, and was truly spectacular. 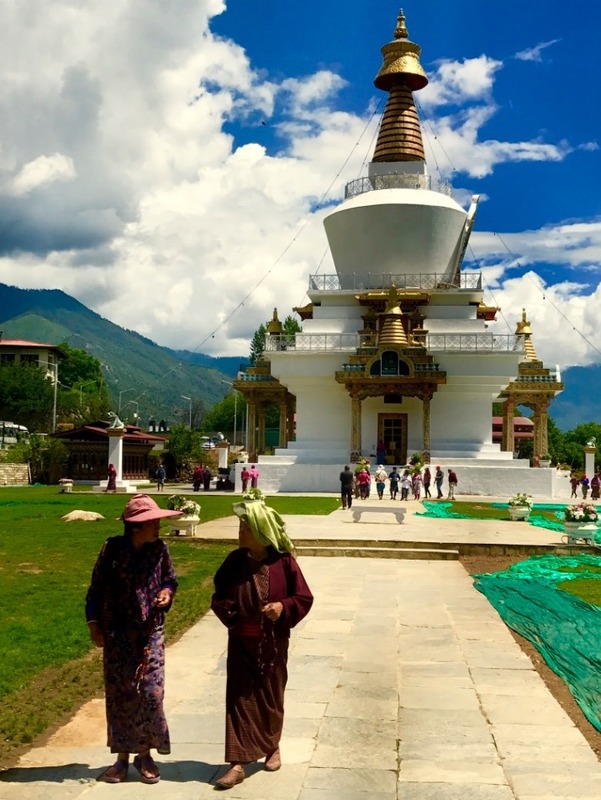 Next stop was National Memorial Chorten, one of the most religious structures in Thimphu, and for many Bhutanese, especially the elderly, the focus of their daily worship. 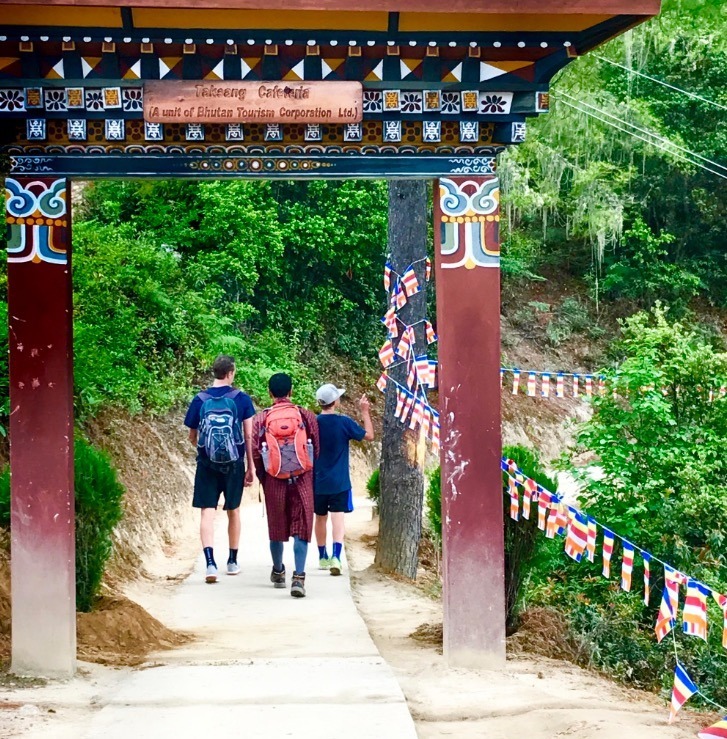 They spend much of the day walking in a clockwise direction, swinging prayer beads, and spinning prayer wheels. We sat and watched for a while, and every person seemed so peaceful and content. There was no irritation if the person in front wasn’t moving quickly enough, they were just… happy I suppose. 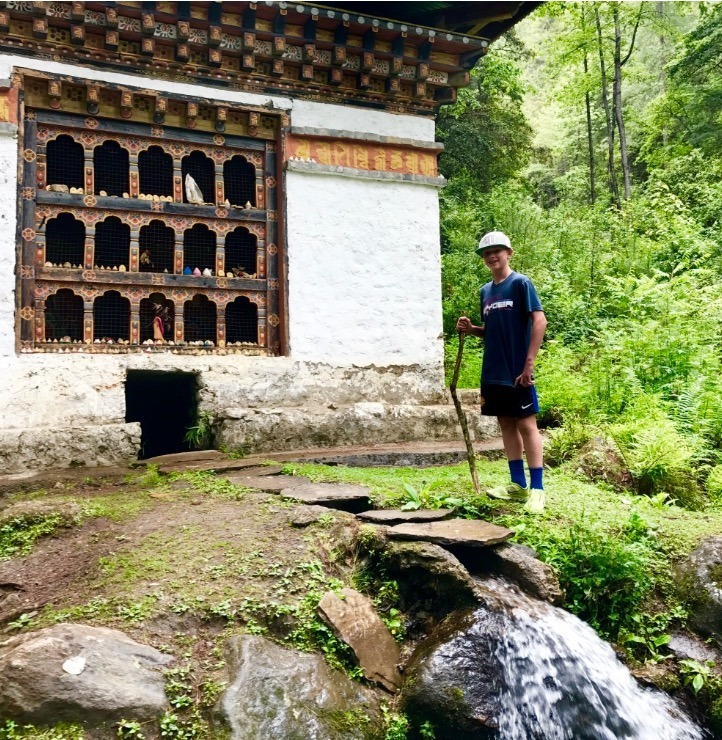 We checked out the Takin sanctuary (the Takin is the national animal of Bhutan and is a bizarre cross between a goat and an antelope), Folk Heritage museum, and even managed to find a pick up game of futsal for the boys! The following day we headed to Paro. Our resort was outside town, and we dropped our bags and left to explore our surroundings. 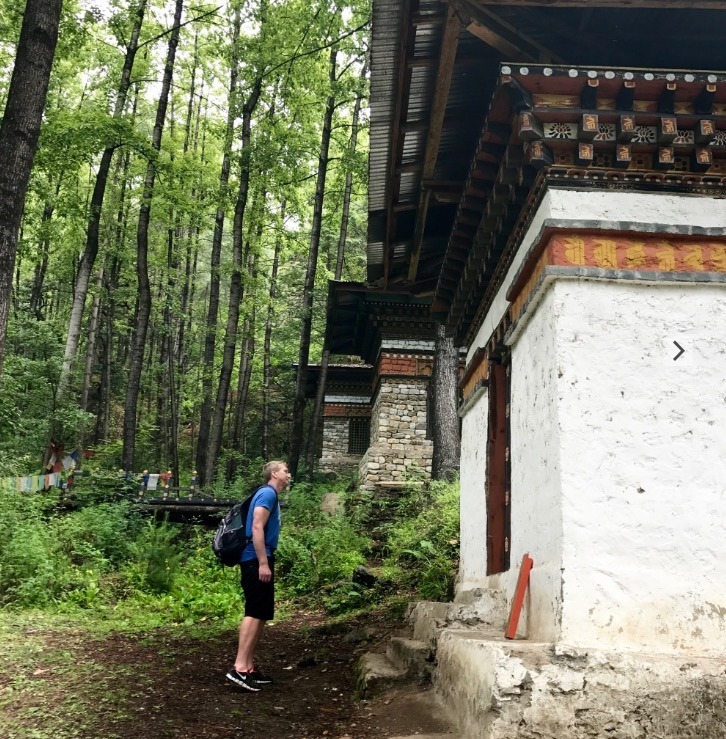 We found a tiny little village, a tiny monastery, a wild pack of dogs (seriously reminded me of Cujo snarling and drooling all over the place) and even found wild marijuana growing on the side of the road. After another great meal, we headed to bed before the ‘piece de resistance’ portion of our trip. 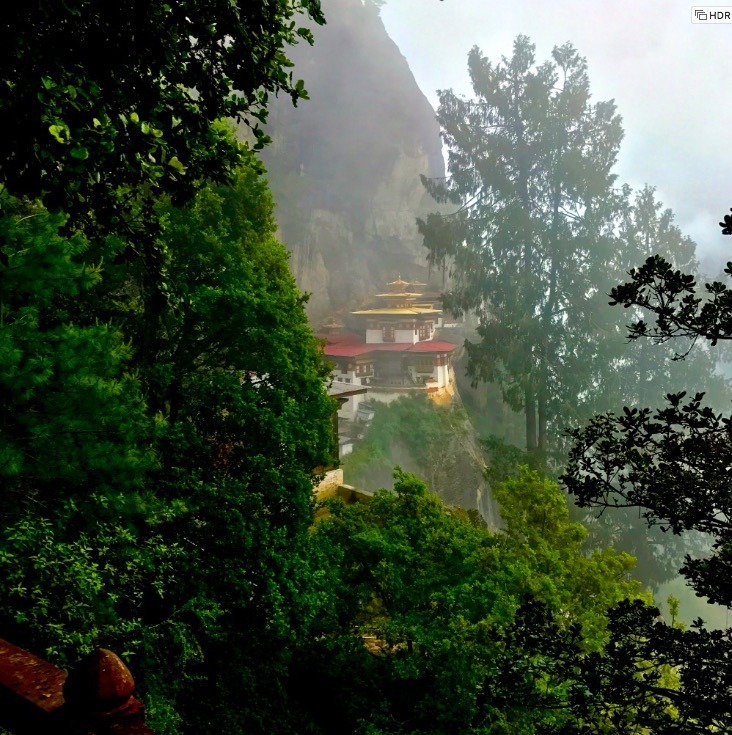 The following day we were hiking to Tigers Nest Monastery and could hardly wait. 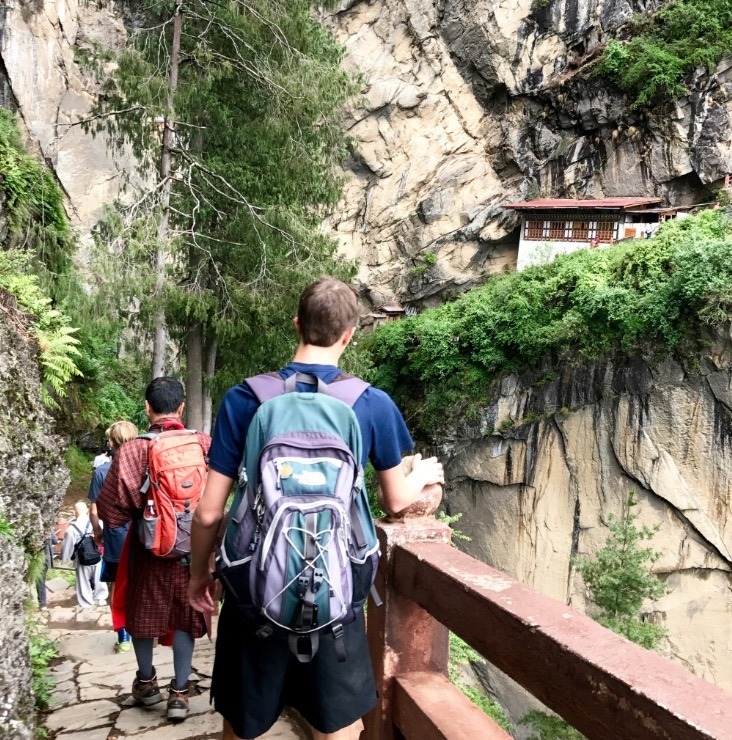 The pilgrimage to Taktsangor or Tiger’s Nest, was literally and figuratively the highest point of our trip at 10,000ft above sea level. 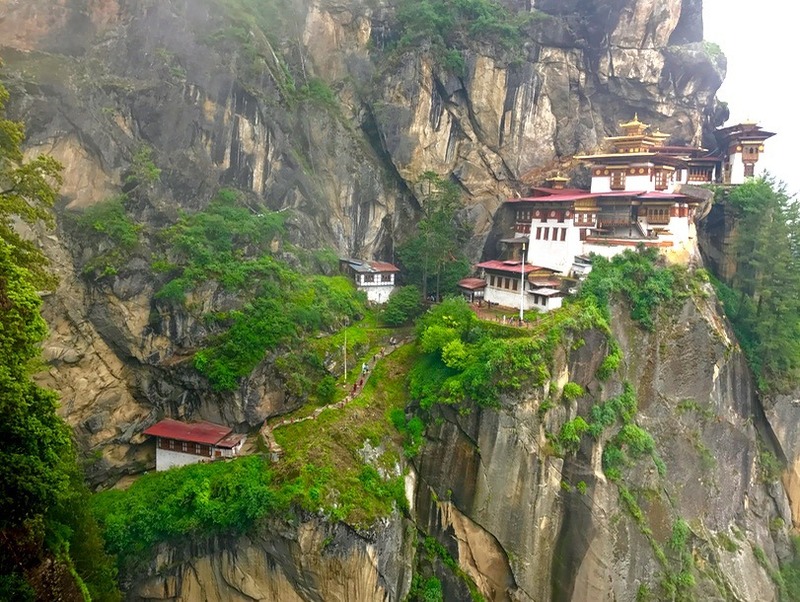 The monastery is the holiest site in Bhutan. 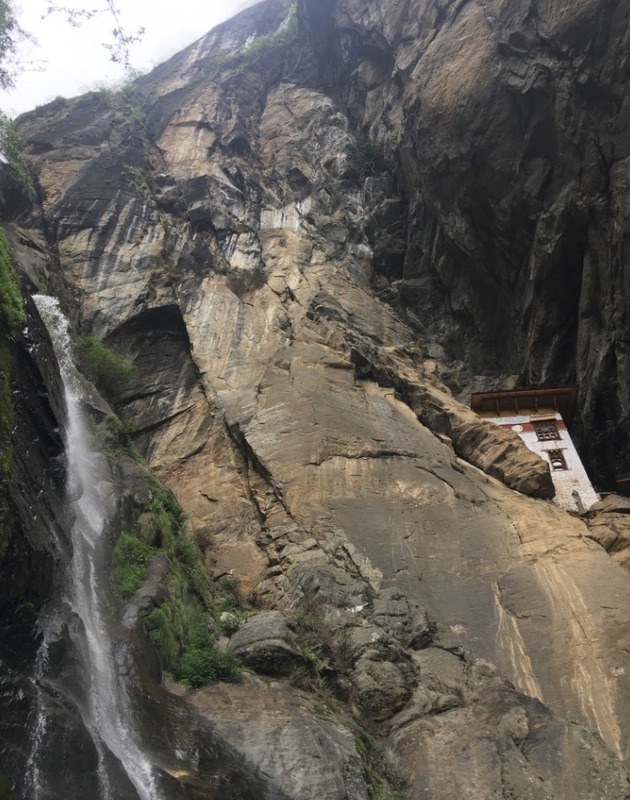 Legend has it Padmasambava landed at Paro Taktsang to meditate when he brought Buddhism to Bhutan in the seventh century. He’s said to have arrived on a flying tiger which had recently been his Tibetan concubine. (For real…can’t make this stuff up). 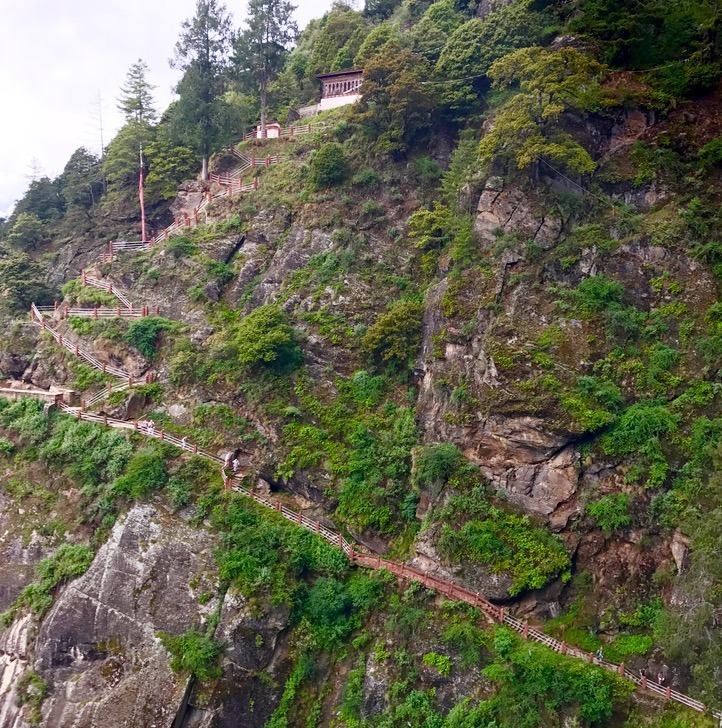 It’s a steep climb to Tigers Nest and the trail hugs the side of a rocky cliff 3,000 ft above the Paro valley. 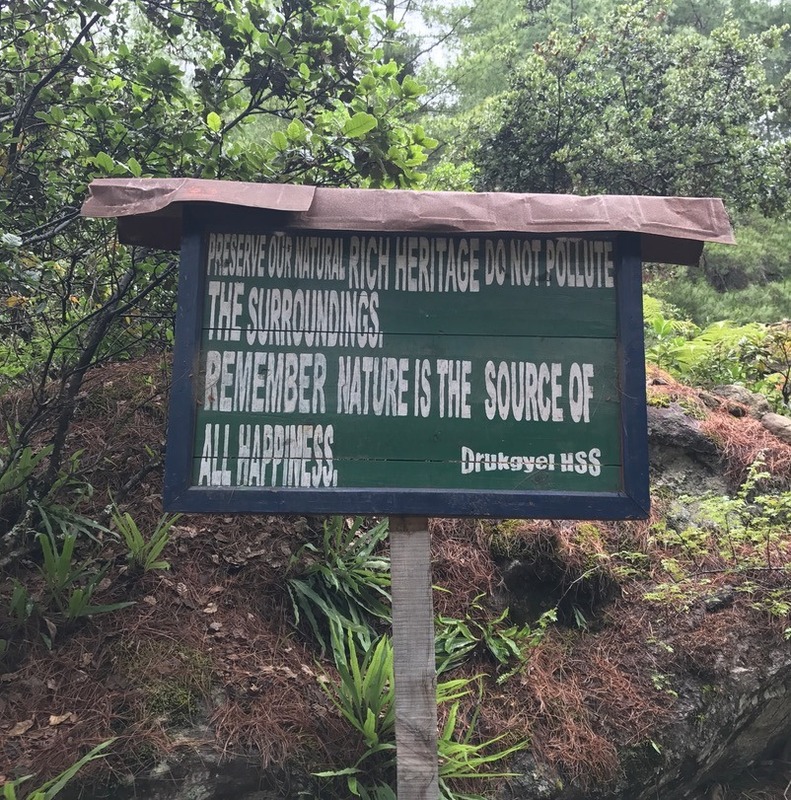 The first part of the hike is through thick forest, once you’re out of the forest you quickly gain altitude. 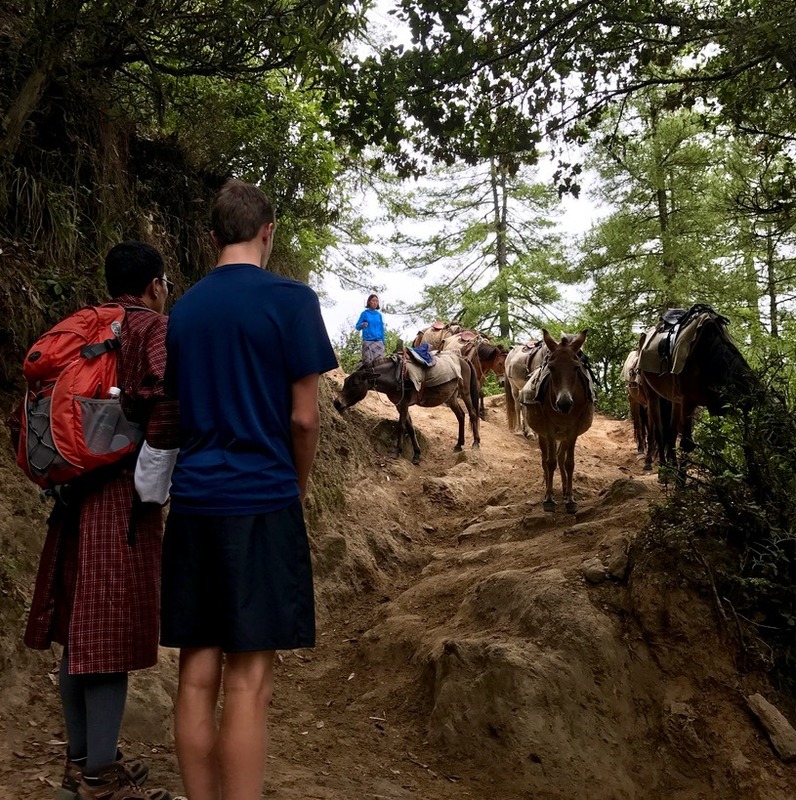 It’s steep, dusty, hot and we did have to share the 4ft path with about a hundred horses at one point, trying to navigate their way up the mountain with ‘less active’ tourists on their backs. At some turns along the climb, there were spectacular views of Paro and teasing glimpses of Tiger’s Nest which still seemed so far away! There were plenty of opportunities to admire the view and to catch our breath. 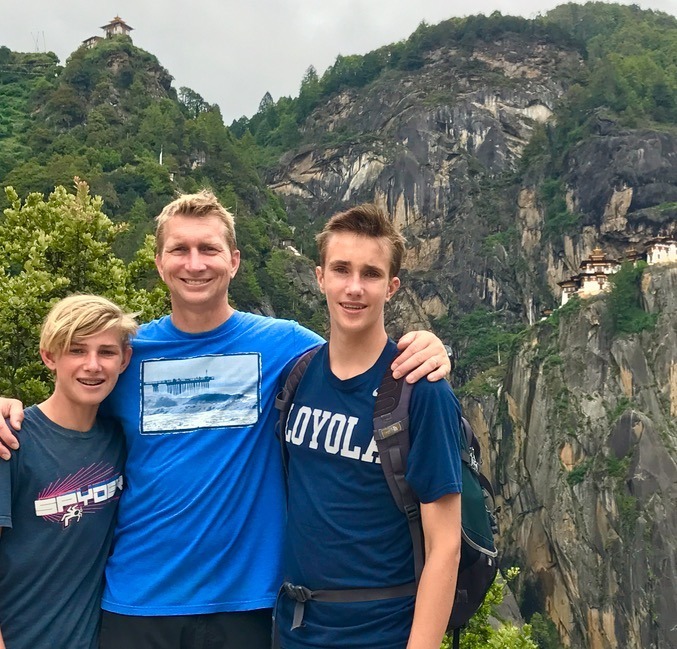 For those of us who live at sea level it can be difficult to breathe comfortably while exercising vigorously at 10,000 feet, so we tried to keep a constant and relaxed pace. 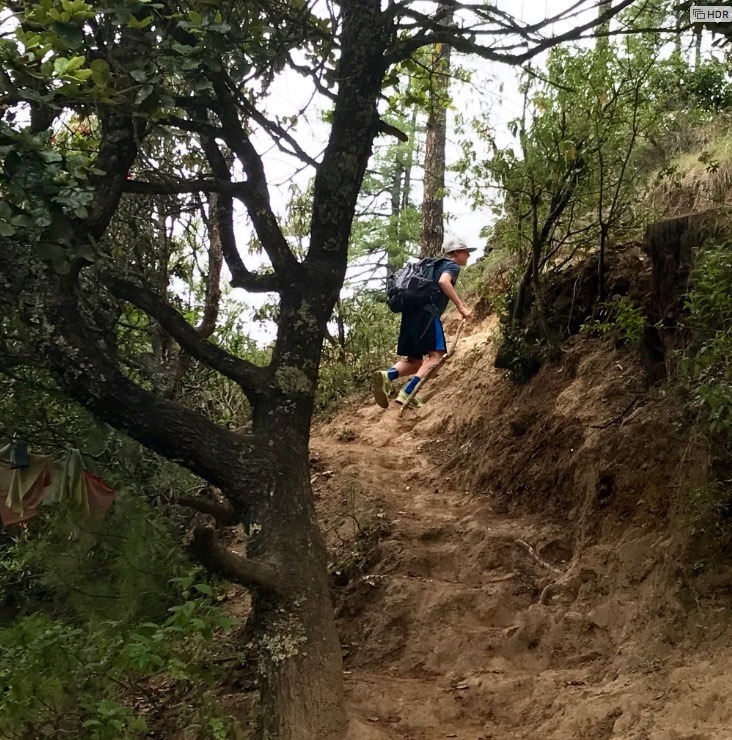 Julian asked Qewong what the fastest time was anyone had hiked this, and when he was told about 45 minutes, Julian immediately decided he had to break the record, and began a fast sprint. (which didn’t last long at all)! 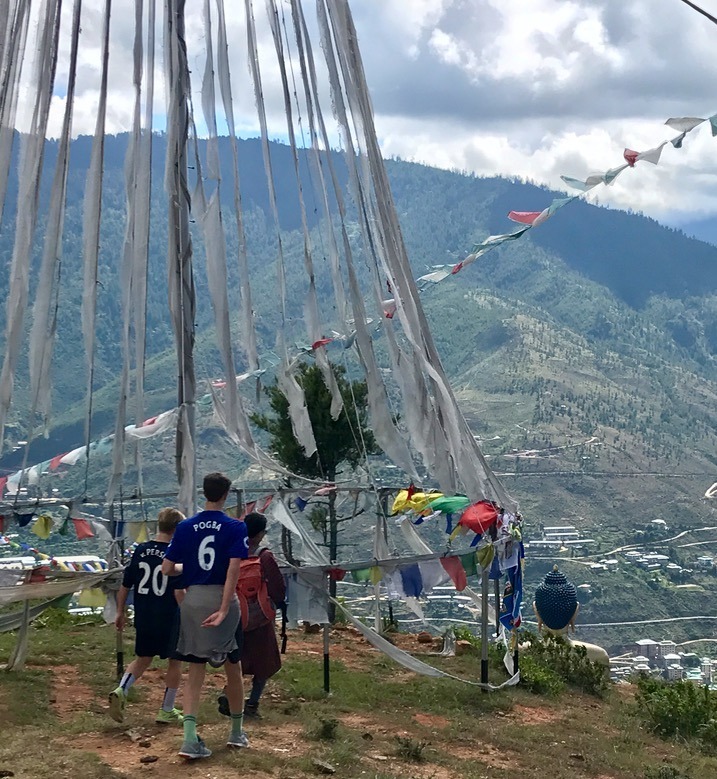 We hiked up the mountain and passed thousands of pretty prayer flags, groups of monks on their pilgrimage, and heavy breathing tourists focused on their goal. Finally we climbed the last steep and treacherous 1000 steps (both up and down) and were almost at the entrance. 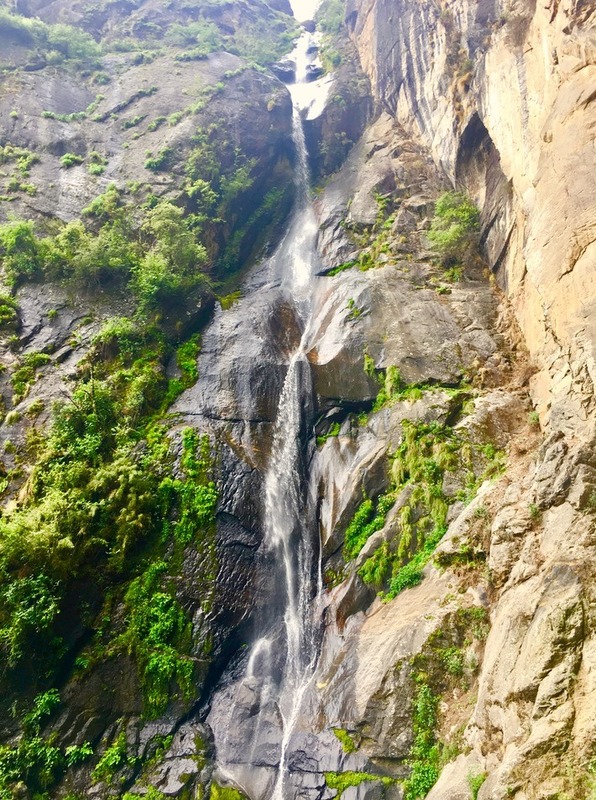 After a 3 hr climb, we hiked over the last bridge, past a waterfall (that dropped 200 ft into a sacred pool), and we finally arrived. Honestly the photographs don’t do it justice, and we all were aware we were sharing something very very special. After crossing the small bridge at the foot of the waterfall, it felt as if we were climbing the steps into heaven. It was overwhelming, bigger than us, and I couldn’t help but shed a few tears of happiness. Once at the entrance, we were unable to take any more photos. In fact, you have to “check in” your backpack, camera and mobile phones at the ticket counter. They take this very seriously and a stern security guard frisked us to make sure we were not smuggling in cameras. We visited the many sacred temple rooms. 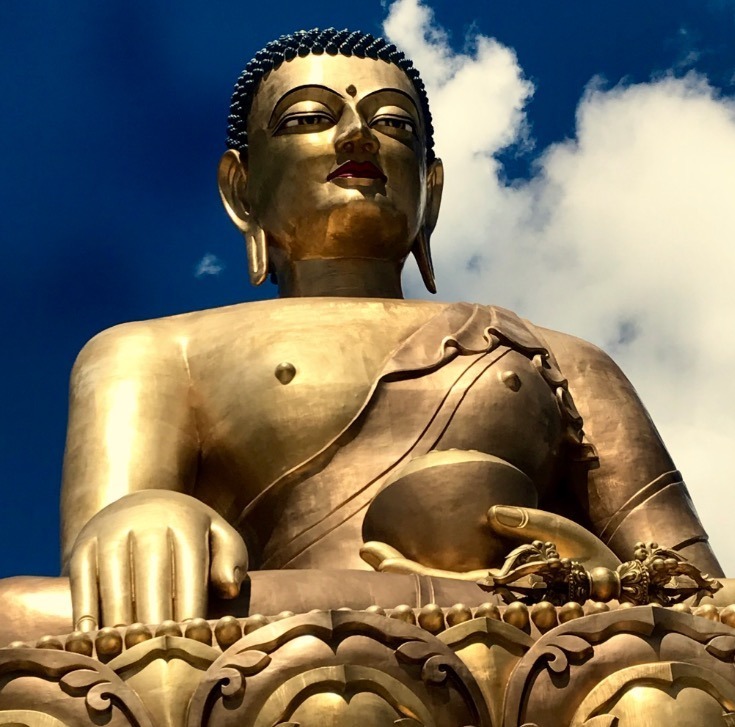 Each room is filled with flickering traditional butter lamps, Buddhist deities and fresh offerings of food and money. The smell of incense filled the air and we heard chants and prayers from monks nearby. 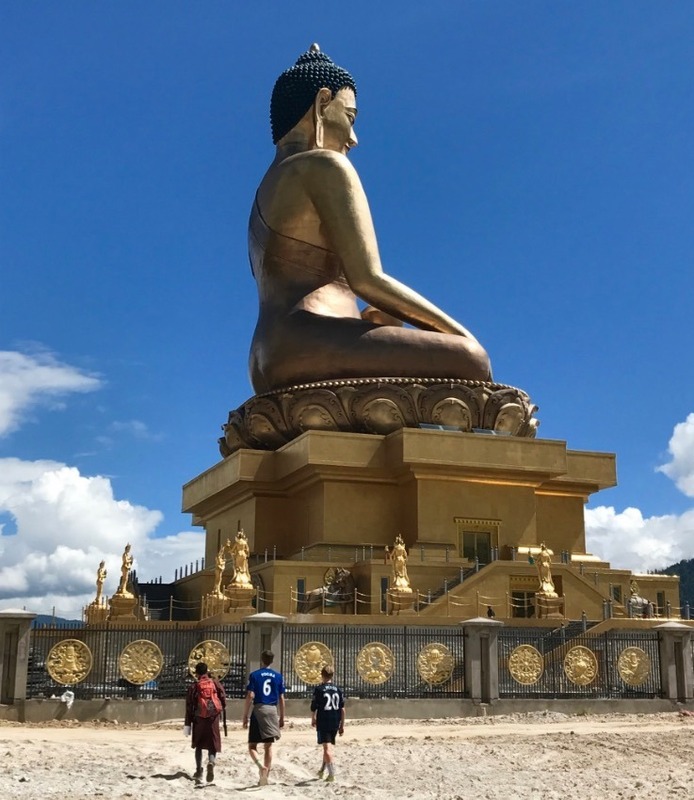 We entered one room filled with about 30 young Buddhist monks in training, chanting sacred texts and singing their prayers under the watchful eye of their senior monk. I gave one a little wink and he mischievously gave a toothy smile and carried on with his prayers. The spirituality of the monastery is omnipresent and it’s hard not to feel overwhelmed witnessing such a sacred place. 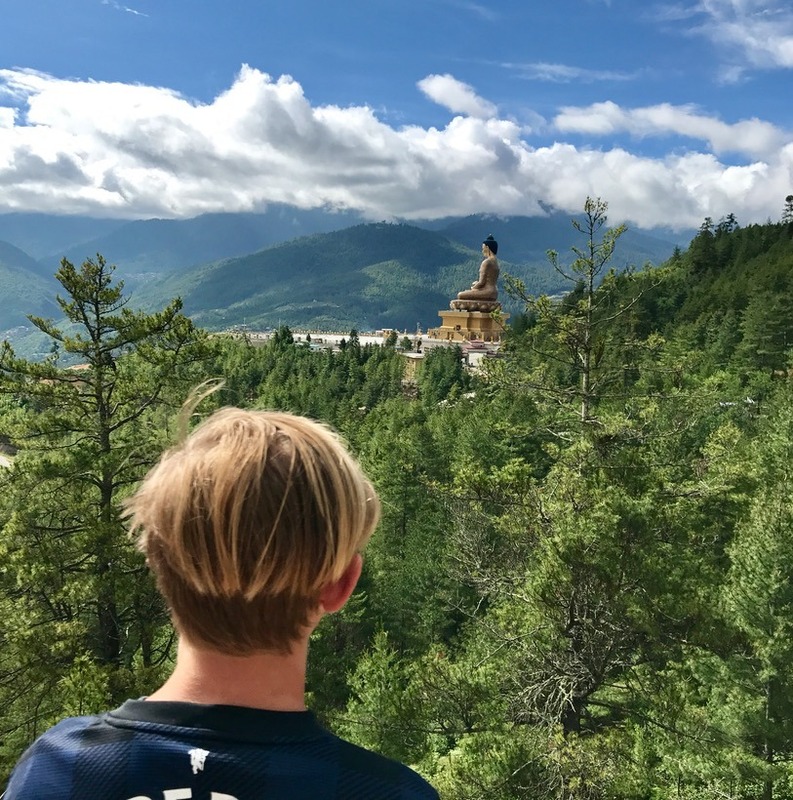 At first I was super bummed we couldn’t take pictures to document this part of the trip, but exploring the temples with our eyes and not through a camera lens, allowed us to really feel the power of this moment. 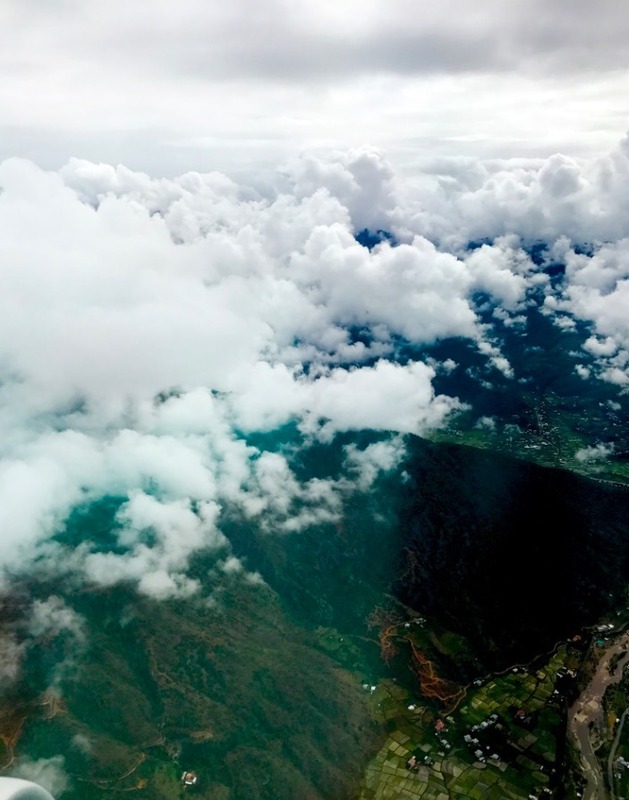 We felt every silent room of that special place in the clouds, thousands of feet up on the side of a mountain deep in the Himalayas. As we made our way down the mountain, I couldn’t help but think of my dear friend Katherine who suddenly passed away last year. She was a huge hiker and we talked about her coming on one of our trips. It’s funny because I told Hot Hubby I was thinking about Katherine and he said that’s so weird, he was thinking about her too…. Then (I promise I’m not making this up for dramatic effect) we saw the most beautiful blue butterfly. Call me crazy, but I just have the strangest feeling she was on that pilgrimage with us and she was letting us know she’s doing just fine. 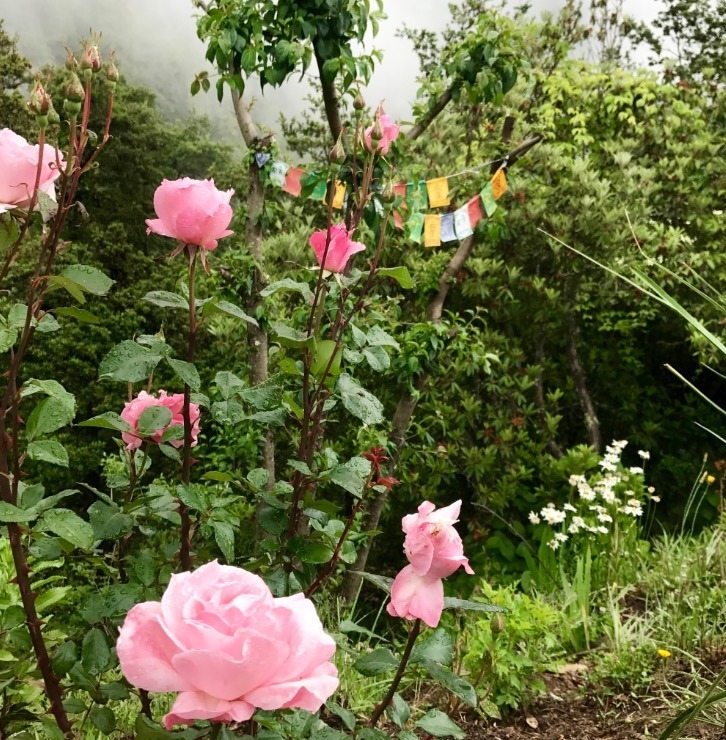 It’s amazing where your mind goes when just trying to breath, walking through nature and spirituality, putting one foot in front of the other and reflecting. My gorgeous boys on the way back down! We arrived at the bottom and realized we were starving after 6 hours of vigorous exercise. We headed to a local restaurant, Qewong called ahead, and ordered endless plates of momo’s. Our bodies ached, our hearts ached, and we were spent. We headed back to the hotel, all took hot baths, ordered a cold beer (not for the kids obvi), and climbed into our huge bed and watched a family movie. Best part of these long trips for me is the uninterrupted family time. I mean of course the boys bicker about personal space and who gets the last Fanta, but overall these memories are etched in our minds forever. 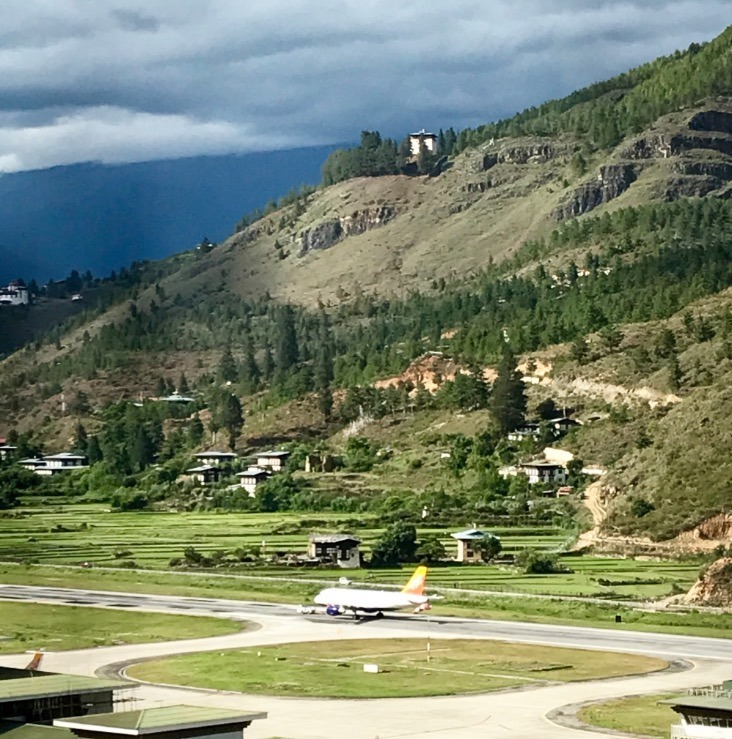 We needed to wait for the clouds to lift in order to fly out of Paro to Delhi, as the take-off is directly into the mountains. Basically, the pilot bombs full speed down the shorter than average runway, pulls up the gear, and follows a visual departure path that is designed to gain as much altitude as possible, all the while he’s weaving through the mountains as he rapidly ascends (cue medication… gulp)! 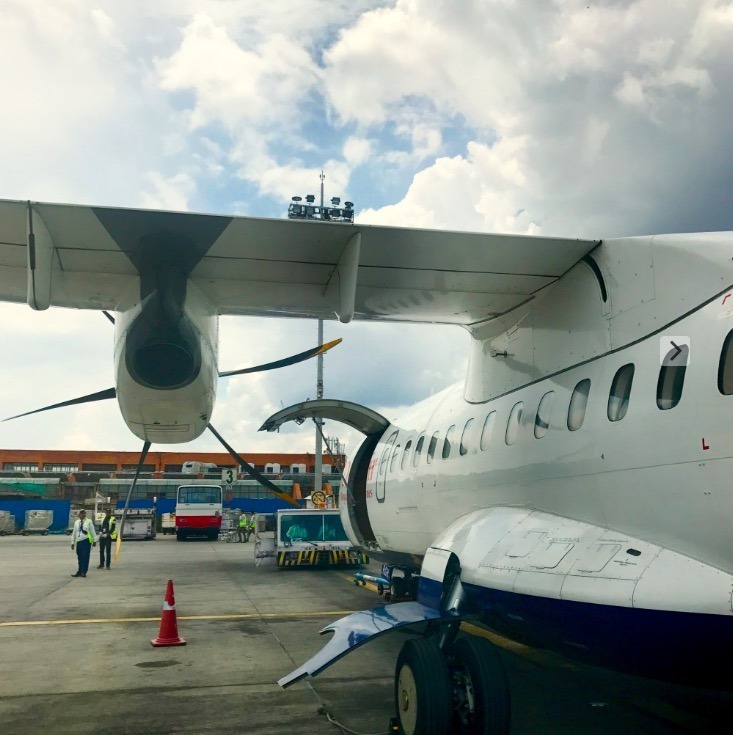 The aircraft sharply lifts and bounces as it gains altitude and I literally had my fingers crossed just praying the engines didn’t stall and we didn’t hit a mountain. 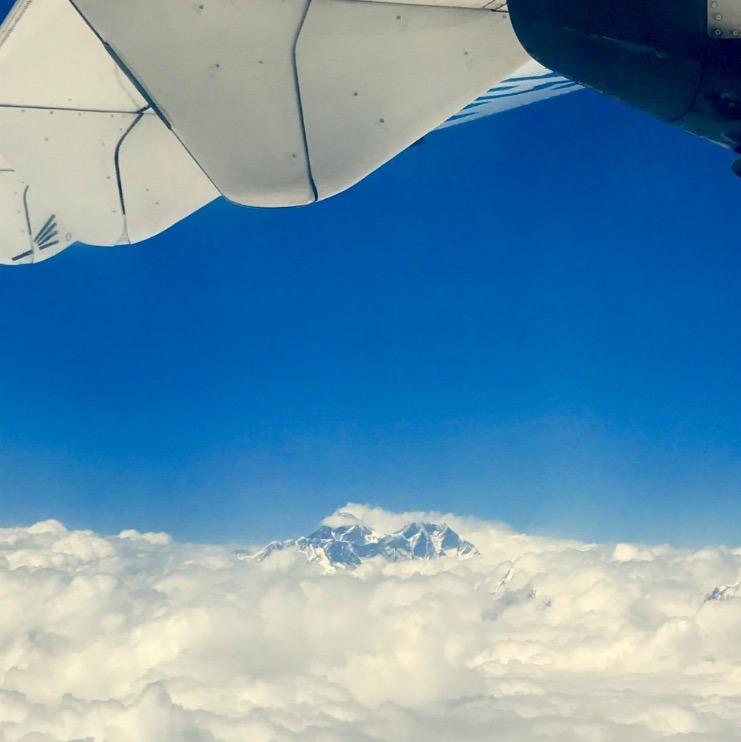 However, about 15 minutes into the flight I was drinking my wine and looking out the left side of the aircraft at the amazing Mount Everest poking through the clouds. (Yes, it was just as mind-blowing to see the second time). So that was that. We settled into the 2 hour flight to Delhi, for the final leg of our adventure. 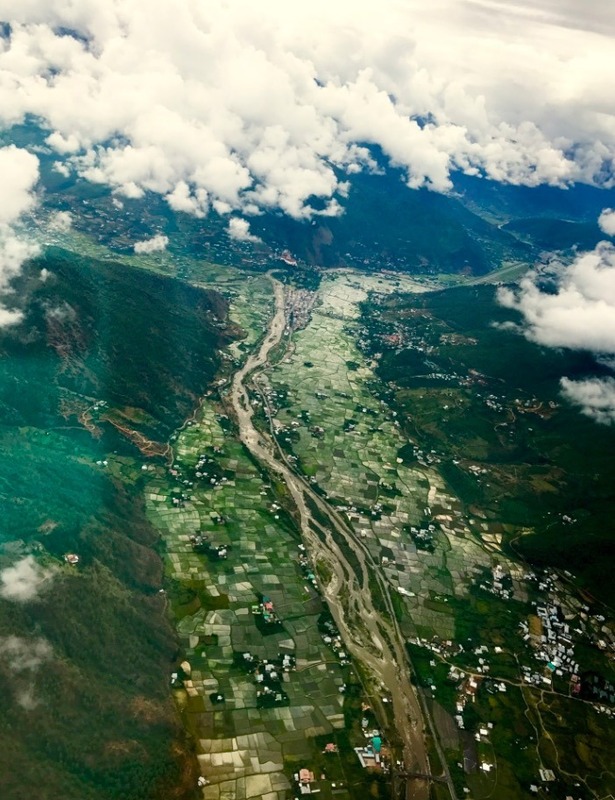 Did it take more preparation for us to take an adventure trip to Bhutan…. absolutely. But we all agreed that this was one of the most special and incredible trips that we have ever take as a family. 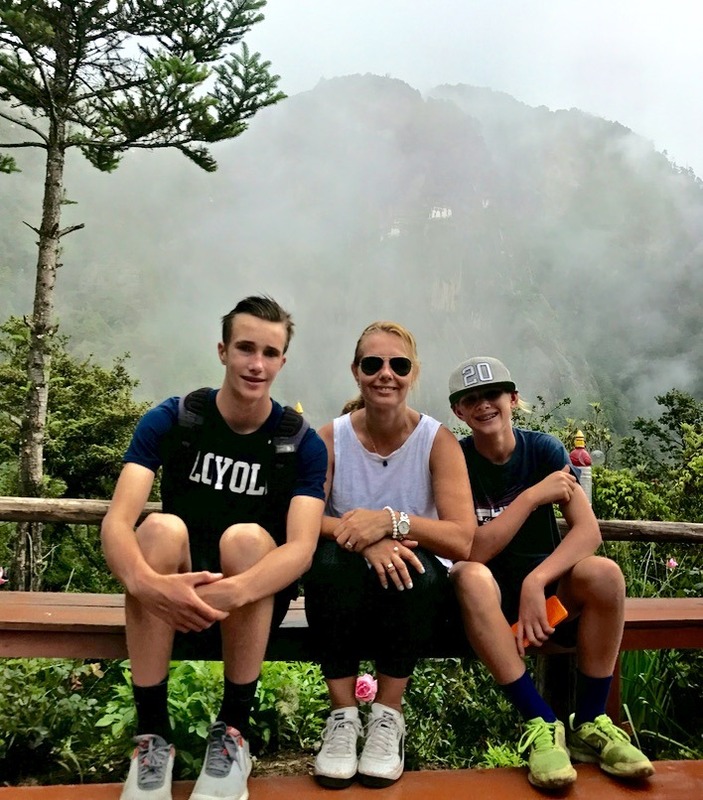 Where is your dream family vacation?